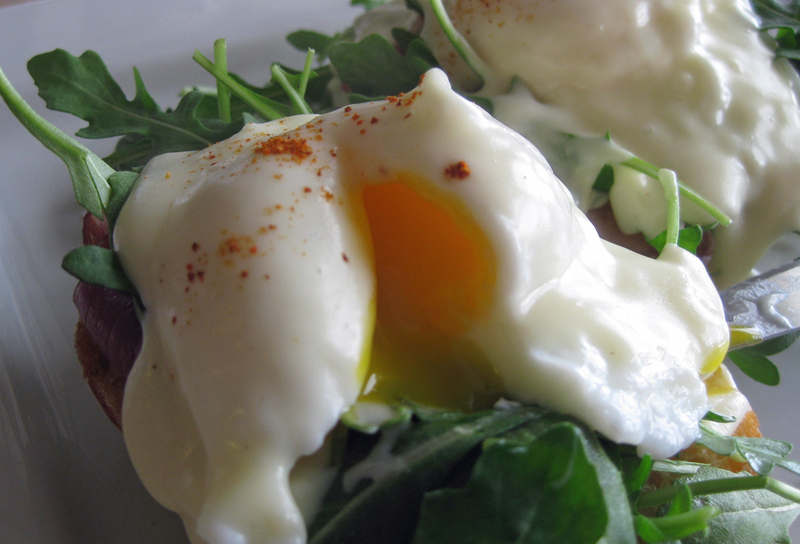 Peppery arugala compliments the mornay sauce and creamy yolks in this version of Eggs Benny. Weekends are special in our house. Not only do we get to sleep in, usually, we also get to chow on brunch items that are heftier than our usual weekday oatmeal, yogurt, or muesli. We try to keep eggs, bread, milk, cheese, and some meat item on hand for these rich weekend brunches. Lately, we’ve been poaching eggs and serving them with everything from soup to salad to endless variations of Eggs Benedict. In fact, it’s been a while since we’ve had a traditional Eggs Benedict breakfast. The idea of Eggs Benedict may seem a little intimidating but the dish is actually very easy to make and we’ve had great success with it over the years. Making a hollandaise sauce is simple when using our blender. We get that with all the butter and egg yolks the sauce is heavy, even for a large breakfast, so we try to limit our consumption of the sauce to special occasions – mostly. The typical Eggs Benedict is made with English muffins, Canadian bacon, poached eggs and hollandaise sauce. The origin of the dish seems to be up for debate. The choices are between a New York stock broker, Lemuel Benedict, a New York banker residing in France, Commodore E.C. Benedict, and a New York couple named Mr. and Mrs. Le Grand Benedict. Food historians seem to agree that the dish was created around the late 1800’s to early 1900’s. (source: Wikipedia). Whatever the origin of the Eggs Benedict, it appears that the concoction was inspired by the appetites of wealthy New Yorkers who were bored of their typical breakfast fare. We’re not wealthy by any means, and while we love New York, we’re San Franciscans who love a good deal. So, for the those bohemians on the west coast who love to eat well, we offer the Eggs Benny, a simpler take on this rich classic. The construction of the dish follows the traditional pattern – bread, meat and/or vegetables, eggs, and sauce, but the ingredients consist of whatever you currently have on hand in your fridge. We prefer a béchamel or mornay sauce with our eggs, meat, and toast. The béchamel is a simple milk, butter, and flour sauce. The mornay sauce is a béchamel with cheese added to it. Steve can whisk up these sauces in just enough time for Jason to toast the bread and poach the eggs. They’re quick and easy. There are many variations on the traditional Eggs Benedict including Eggs Blackstone, which substitutes ham for the streaky bacon and adds a tomato slice. Eggs Florentine substitutes spinach for the ham. There’s also a Country Benedict, sometimes known as Eggs Beauregard, which replaces the English muffin, ham and hollandaise sauce with a biscuit, sausage patties, and country gravy. The poached eggs are replaced with eggs fried to your liking. There are many other variations of this simple, yet classic, construction. We’ll stick to our own versions of Eggs Benny which for us means having poached eggs, toast of some kind, some sort of meat or sauté of vegetable, and all topped with a creamy sauce – hollandaise, mornay, or béchamel. So, now there is no urgent need to run to the store for English muffins and Canadian bacon. Just use what you have on hand and call it Eggs Benny. 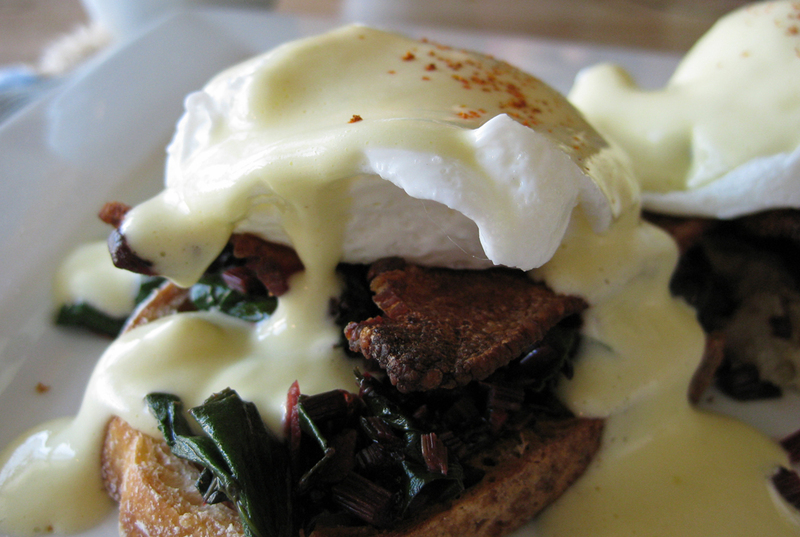 Crisp bacon, sauteed chard, and creamy hollandaise sauce in another Eggs Benny brunch. For poached eggs: In one sauce pan, boil hot water. In a separate skillet, simmer water. Boil the eggs in the sauce pan, with the shells on for 30 seconds. This will help to keep the whites together when poaching them. Crack each egg into one of four separate ramekins. In the skillet with simmering water, slowly pour the eggs one at a time. Allow to simmer for 3-5 minutes or until the whites are cooked and the yolks are still soft to the touch. Alternately, you can also add a tablespoon of vinegar to the skillet water to help keep the egg whites together, but the eggs will take on the vinegar flavor. Warm milk, bay leaf and thyme, if using, in a saucepan over low heat. While milk is warming, create a roux by melting the butter in a separate saucepan over medium heat. When completely melted, add flour and whisk constantly, approximately 2 minutes, being careful not to brown the roux. Take out the bay leaf and thyme from the milk. Pour the hot milk into the roux while continuing to whisk until roux and milk are completely incorporated. Season with salt and white pepper and continue to whisk until sauce begins to thicken. Sauce béchamel becomes sauce mornay when the cheese is added. If you intend to add the cheese, be sure to remove the sauce from heat before whisking in the cheese. Serve hot. To assemble: place the toast on the plate, then add the meat and/or vegetables. Place the poached eggs on top and then drizzle with the sauce of your choice. Decorate with a pinch of cayenne pepper or paprika. Serve at once. Note: Leftover béchamel or mornay can be stored in an airtight container in the refrigerator for three or four days. Refrigerated, béchamel becomes very thick. Add it to scrambled eggs or sautéed greens for added creaminess. Or, spread it over rustic bread and toast under the broiler for a delicious open-faced croque.